Tashkent City branch of the Ecological Movement of Uzbekistan at the Tashkent College of Economics and Business held public hearings aimed at examining the state of execution of the Law of the Republic of Uzbekistan “On the Protection and Use of the Plant World” in the field and discussing the topic “Preventing the illegal cutting of perennial trees and protecting them from pests”. On March 4, 2019, a conference of the Samarkand regional party organization of the Ecological Party of Uzbekistan was held in the conference hall of the Samarkand Medical Veterinary Institute. In accordance with paragraph 12. of the “Roadmap” to support the activities of the Multi-Partner Trust Fund for Human Security for the Aral Sea Region ”to conduct public actions in support of initiatives to mitigate the effects of the Aral crisis on the Aral Sea region, on March 16-17, Khorezm, Bukhara and Karakalpak party organizations of the Ecological Party in Khorezm region and the Muynak district of the Republic of Karakalpakstan organized charity hashars and other events under the motto: “Help the Aral” together with volunteers of the US Columbia University student fund “The World Aral Region Charity INC” . On March 4, 2019, a conference of the Fergana regional party organization of the Ecological Party of Uzbekistan was held in Fergana. 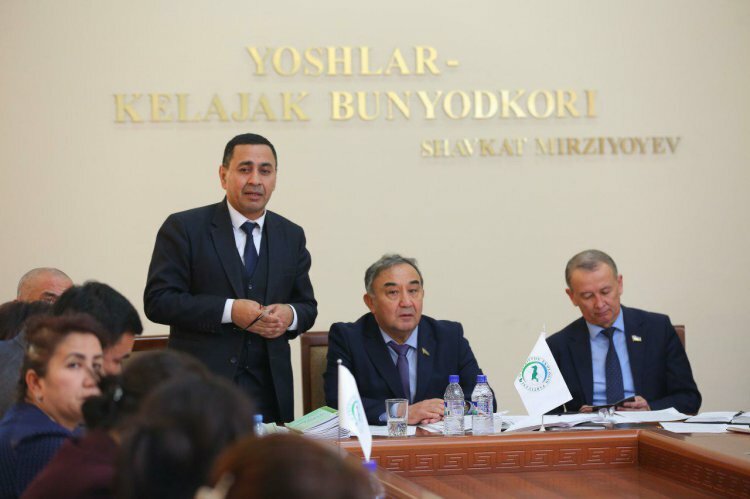 Approved at the Constituent Congress of the Ecological Party of Uzbekistan, 8 January 2019. Since independence, the government of Uzbekistan has been consistently carrying out large-scale constructive socio-political, and socio-economic transformations, aimed at achieving sustainable development of the country and improving the welfare of the people. Further growth of the concentration of CO2 in the atmosphere and in the oceans will lead to the fact that life in the Antarctic coasts cease to exist due to a strong acidification of the deep and near-surface layers of water. "Round table" in Bukhara region on the topic: "The Basics of Ecological Culture"
Bukhara regional branch of the Ecological Movement of Uzbekistan in the secondary school No. 14 organized and held a round table on the topic: “The Basics of Ecological Culture”. It is not a secret for anyone that the state policy aimed at ensuring environmental safety, rational use of natural resources and their preservation for future generations, the creation of favorable conditions for human habitation, has acquired the highest relevance in our country.